Leader – This new mechanic that was added in Dominaria lets a creature absorb Creature Tokens of certain sub-types gaining a reinforcement. When a creature with Leader enters the battlefield, it can also absorb existing tokens, entering the battlefield stronger already. Finally, some Leaders, such as Squee, cannot gain P/T bonuses from being reinforced. In MtGPQ, due to the reinforcement mechanic, token strategies are inherently less powerful (outside of some combo strategies). Since all tokens group under a single creature, it makes the strategy more vulnerable to single-target removal. Single-target removal (both sacrifice and targeted destruction), due to the 3-creature limit, becomes significantly better than board wipes (particularly damage-based board wipes). By creating an “upgraded token” in the form of a Leader creature, we can increase the viability of token strategies in new and exciting ways. Slimefoot is an example of this. 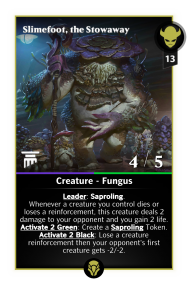 Not only does he make all your Saproling tokens bigger, he also presents a really strong payoff for using lose reinforcement cards. Finally, he can fuel himself if you put in the effort to activate his ability. Reinforcements are a huge part of MtGPQ and were somewhat underrepresented. We’ve been exploring this design space recently but we had yet to create the possibility of an archetype that cares solely about reinforcements. Enters Squee, the Immortal; the goblin that never dies. 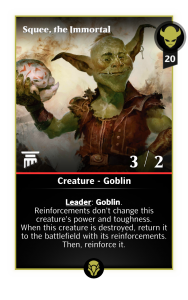 The idea behind Squee is presenting a Leader who can serve as a reinforcement bank for payoffs in DAR: Siege-Gang Commander, Goblin Warchief and Goblin Barrage. Since he cannot be removed, except by bounce and exile, he presents a guaranteed way of always having reinforcements for triggering certain cards’ abilities. A third, less important, reason is the (sometimes spot-on) flavor of having Legendary and/or Token Making creatures leading the tokens they create into battle (becoming stronger as they are created). Generally speaking, the Leader keyword has opened a whole new design space that we intend to explore going forward. You can expect to see Leader in creatures from tabletop MtG that are Legendary, Token Creators and/or Token Strategy Payoffs. Over time, this mechanic should make several interesting token strategies possible. Hopefully, you’ve enjoyed this short explanation of the reasoning behind the Leader mechanic.